The DJI Focus uses DJI’s expertise in brushless motors for previously unheard of levels of precision and accuracy. The brushless motor puts just ±0.002° of accuracy in your hands so that turning the remote is just like turning the lens itself. It also features high torque and a fast reaction speed so you can keep your subject in focus no matter how it moves. 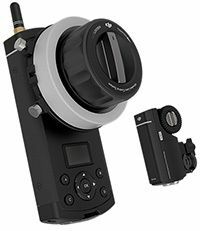 Unlike traditional follow focus systems, the DJI Follow’s motor assembly is a self-contained system that combines a brushless motor and a receiver. Not only does this make it more compact and easier to install, it requires only a single power source, giving you more attachment options than ever. On the ground, the remote control transmits at distances of up to 100m with just 14ms of lag. Attached to an Inspire carrying either the Zenmuse X5 or Zenmuse X5R, it connects directly to the aircraft remote, giving you seamless camera control across your entire flight range. While cinema lenses feature built-in hard stops, photography lenses do not. On the DJI Focus you can tune the lens to match the end-points of any lens you want to use. Because it uses a Brushless motor, the onboard computer knows exactly which position the motor is in, letting you set up in seconds simply by turning the lens to infinite and marking it, then repeating at the other end. An OLED display menu on the remote lets you fine tune how the DJI Follow works for you. You can even set multiple focus points, and the speed the camera racks between them making complex moves simple and repeatable. Full compatibility with the DJI X5 camera series is built in, giving you absolute control of your camera focus when in the air. When used with a Ronin or Ronin-M you can pull focus from all around the set wirelessly, adding new depth to your Ronin footage. Two ports have been built in, so that as technology develops and improves you can expand your DJI Focus with even more features and capabilities. Connect other accessories to the DJI Focus or even connect it to other pieces of your equipment. A built-in rosette mount means it can be fitted wherever you need it securely. The included long-lasting single cell battery can power the DJI Focus throughout a shoot, but if you run out in can be swapped in seconds. You can charge it in the studio or even on the move from a power pack through its USB recharging port.